Signs can play a key role in helping a company or facility create the right experience for its clients or guests. At Star Signs, we welcome the opportunity to work with architects, designers, and general contractors to develop signage solutions which complement the architectural environment in which they will be installed. 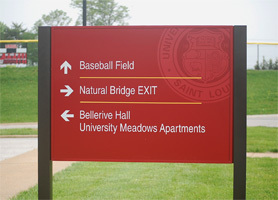 Our wayfinding expertise and understanding help to ensure that your signage package will enable visitors to effortlessly navigate your facility or campus.